Every household in Spain has at least one or two of the hundreds of varieties of delicious chorizo sausages. Spanish chorizo-type products, often referred to as embutidos, come in many varieties, thick and thin, plain or smoked, some containing lean meat to be served for tapas, or with more fat to flavor stews and grilled dishes. 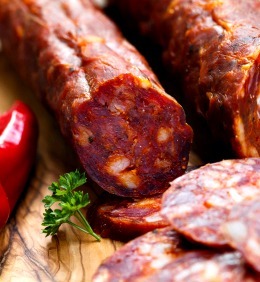 In general, Spanish chorizo always has less fat and is more finely ground than a Mexican one. While Mexican chorizo is seasoned with chile peppers and vinegar, Spanish chorizo is made basically with pork, sweet paprika and garlic, and is cured either to a hard sausage consistency, to be sliced and eaten as an appetizer, or to a softer consistency to use in cooking. Many of the chorizos are deep red in color because they contain pimentón (Spanish smoked paprika). Not only does pimenton lend color and seasoning, but its oils make the chorizo last longer without refrigeration. Remember, until recently, refrigeration was not generally available. Depending on the use of the finished product, lean and fat pork is chopped up in varying proportions. Garlic, salt, herbs and other seasonings are then added, perhaps with a little white wine to speed the natural fermentation process. It then rests for two days. This curing gives chorizo its typical slightly acidic taste. The cured and seasoned meat is stuffed into skins using a sausage machine. Finally, they are then tied and hung up to dry. In the wetter climate of northern Spain, they are sometimes pre-smoked for further preservation. Other related 'embutidos' are salchichón and lomo embuchado. The lomo is an air-dried loin of pork. All the fat is removed from the meat, and then it is marinated in a mixture of seasonings similar to the chorizo. The marinated loin is stuffed in a beef skin and is slightly smoked, or else it is air-dried for three to four months so that it will retain its tenderness. Together with jamón serrano it is the highest expression of the Spanish butcher's art. The Salchichon is similar to the Italian salami. It differs from most chorizos in that it contains no paprika, but does have cracked black pepper. The salchichon from Catalonia contains wine for added flavor. Patatas a la Riojana: When the acclaimed French chef Paul Bocuse was asked to prepare a banquet for the hundredth anniversary of a famous winery in La Rioja, he shared this dish with the kitchen staff and apparently requested a second and then third serving for himself! Spicy Sausage and Cheese Tortilla: This substantial tortilla is delicious hot or cold. Cut it into chunky wedges and serve for supper or a light lunch with a fresh tomato and basil salad. The addition of spicy chorizo and tangy cheese gives it a wonderful, rich flavor. Paella with clams, Serrano Ham, and Chorizo Sausage: Serrano ham is so adored by the Spanish that it is often served on its own, accompanied by nothing more than a glass of sherry. 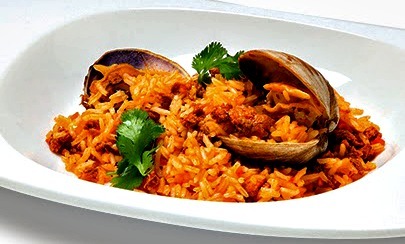 Savor it here as a flavorful accent to this scrumptious rice. If serrano ham is unavailable, the more readily available Italian prosciutto makes a good substitute.